Located near the Houston Medical Center and the Museum District, Rice Village is one of the oldest shopping destinations in Houston. Here you will find an eclectic diverse collection of restaurants, pubs, and boutiques. Salento Wine Bar is nestled along the busy stretch of Rice Boulevard. It is a quaint little café that offers a respite from the hustle and bustle outside. Guests at Salento can choose from casual seating indoors or sidewalk patio dining outside. Food and drinks are ordered via counter service, but your order is brought to your table. Salento is open for breakfast, lunch, and dinner. I arrived at lunch time and took a few moments to peruse the wine list. In addition to the wines, mimosas and Bellini’s were available, but I opted for a light and refreshing white sangria. The lunch menu offered an enticing array of salads, sandwiches, and specials. Normally I would not go out of my way to order beets, but I was intrigued by the Golden Beet Salad. 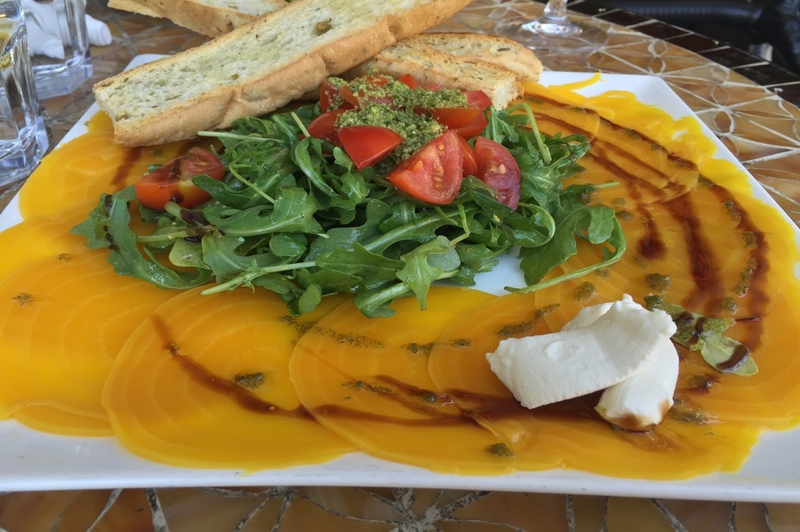 It consisted of golden beets poached in white wine, served with goat cheese, arugula, and cherry pesto. This dish was as beautiful as it was delicious. For my entrée, I decided on the Empanada Platter with a side salad. The platter comes with your choice of two of the following types of filling: turkey & mole, chicken, ham & cheese, or spinach & ricotta. I chose the latter two. 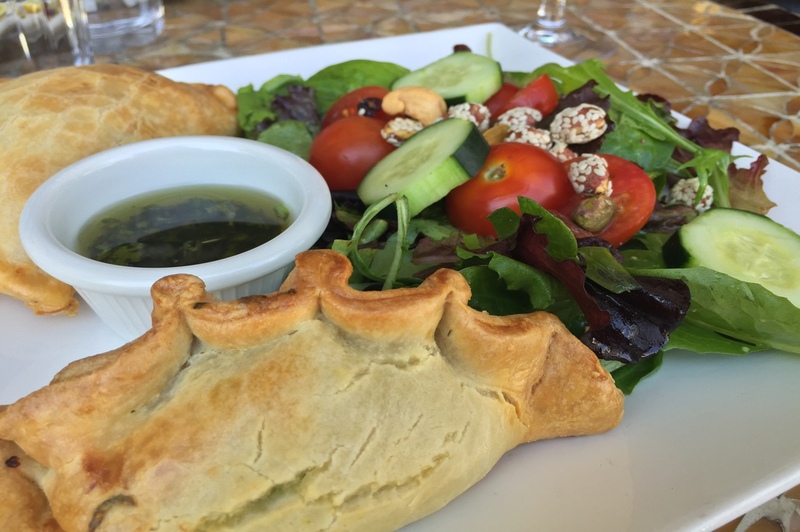 The empanadas were golden brown with perfectly flaky dough and ample filling. They definitely rank among my favorite empanadas. Salento has a wonderful selection of homemade pastries and desserts. 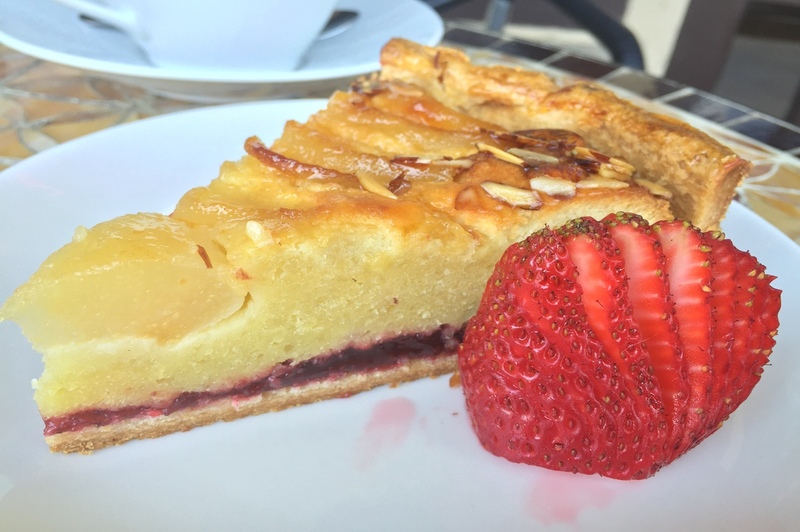 I wasn’t in a hurry, so I decided to relax and enjoy a vanilla latte paired with an almond pear tart. The tart was not overly sweet and had just the right amount of fruit to brighten the flavor. It was the ideal ending to a delightful meal.